Now you are a few steps ahead of being able to send images, videos, and GIFS in your iOS app notifications! Enabling this functionality is quite straight forward, Let's take a look! Technically speaking, rich media in iOS means you can attach media to your notifications and embed custom action buttons (content extensions). In the tutorial below, we will cover the two functionalities, attaching media and providing custom buttons through content extensions. We will be able to do this in 3 easy steps. First, we will create the notification service extension, second, we will allow non-secure attachments then finally we are going to send some key/value pair in the payload. 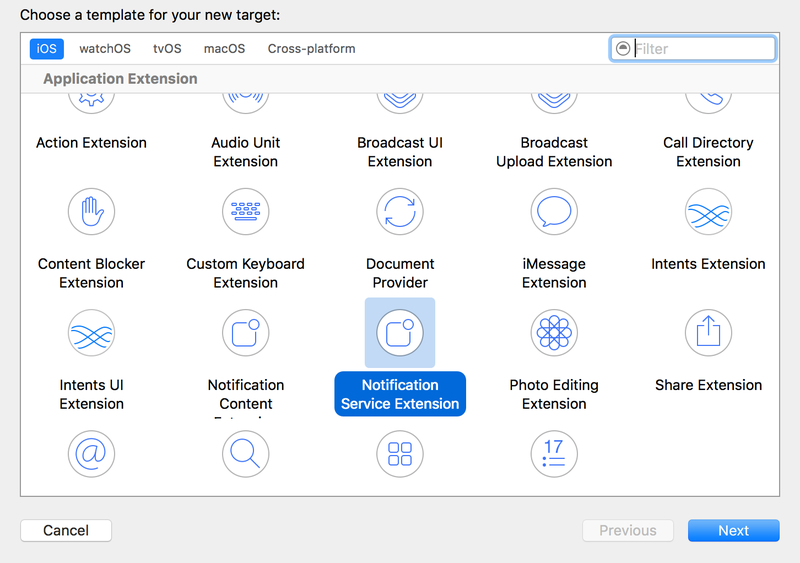 The UNNotificationServiceExtension class provides the entry point for a Notification Service app extension, which lets you customize the content of a remote notification before it is delivered to the user. A Notification Service app extension does not present any UI of its own. MORE! All the code needed in your Xcode project to display rich notifications in your application. You will find notificaiton service class in notification group in xcode. just copy the lines below to didReceiveRequestWithContentHandler in NotificationService class . The URLSession downloads the media and makes sure it is ready to be attached to the notification content, and successfully served to the user. Notification Service Extension is a separate binary and has its own Info.plist file. You have to add App Transport Security Settings with Allow Arbitrary Loads flag set to YES to extension's Info.plist file. Then you need to add the media attachment URL to the payload in its own . Make sure the key ("attachment-url") you’ve used in your Service Extension is the same as the key here. How do I add custom actions to my push notifications in iOS 10? 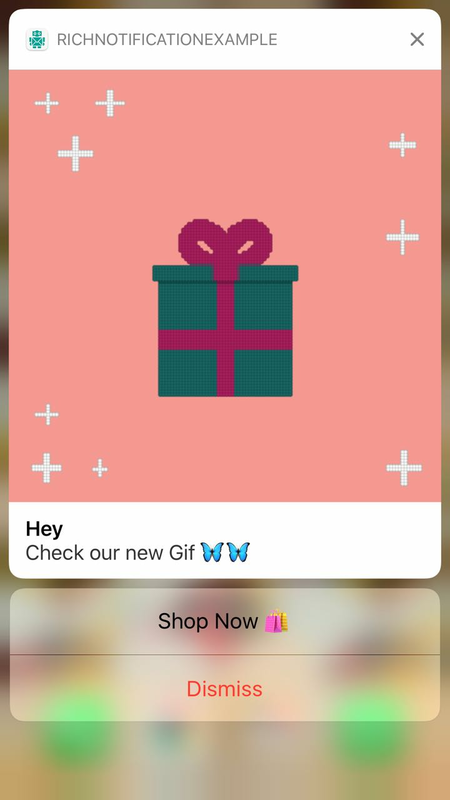 UNNotificationAction *readAction = [UNNotificationAction actionWithIdentifier:@"ReadNow"
UNNotificationAction *laterAction = [UNNotificationAction actionWithIdentifier:@"Later"
UNNotificationAction *shopAction = [UNNotificationAction actionWithIdentifier:@"ShopNow"
UNNotificationAction *dismissAction = [UNNotificationAction actionWithIdentifier:@"Dismiss"
UNNotificationCategory *shopCategory = [UNNotificationCategory categoryWithIdentifier:@"Shopping"
title: "Read Now 📰 "
userNotificationCenter(_:willPresent:withCompletionHandler:) is called when a notification is delivered to a foreground app. You receive the UNNotification object which contains the original UNNotificationRequest. You call the completion handler with the UNNotificationPresentationOptions you want to present (use .none to ignore the alert). userNotificationCenter(_:didReceive:withCompletionHandler:) is called when a user selects an action in a delivered notification. You receive the UNNotificationResponse object which includes the actionIdentifier for the user action and the UNNotification object. The system defined identifiers UNNotificationDefaultActionIdentifierand UNNotificationDismissActionIdentifier are used when the user taps the notification to open the app or swipes to dismiss the notification. Feel free to download the full source code examples here.